Shannon and Dean Hale are the award-winning husband-and-wife team behind The Princess in Black, illustrated by LeUyen Pham. Shannon Hale is also the author of the Newbery Honor novel Princess Academy as well as the New York Times best-selling series Ever After High. Shannon and Dean Hale live in Salt Lake City, Utah. Princess and adventure fans alike will clamor for an invite to this not-so-perfect but oh-so-entertaining party. Keeping the world safe from monsters is a daunting task. And only the PIB can accomplish this while throwing the perfect party! Expect high demand. 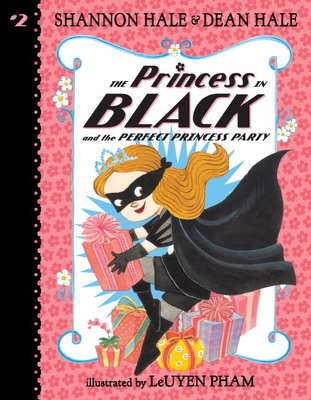 A lively cohort between the ages of 5 and 9 will rejoice to learn that their favorite royal monster-vanquisher has returned, in Shannon Hale and Dean Hale’s The Princess in Black and the Perfect Princess Party. The stories are filled with humor and action, and they show that girls, even girly-girls, can also fight crime and be heroes. Girls who loved the Pinkalicious series (HarperCollins) should find this chapter book easy on the eye and paced for the average reader.